In this book Tim Gent shares his enthusiasm for and experience of travelling and camping from an open canoe. He covers planning a journey, selecting the right canoe and equipment for the journey you are planning and how to pack your canoe. All the traditional skills of campcraft such as fire lighting, cooking on an open fire, campsite selection and many more are explored, as are the more modern lightweight options. If you read Tim’s book you will be inspired to paddle off into the distance and experience the joys of a waterborne nomadic existence … even if only for a break from our modern sedentary lifestyle. Tim has enjoyed an outdoor life since childhood. Farming, forestry conservation and archaeology have provided a working environment in the field, and contributed to an understanding of the land. While paddling and camping from Arctic Scandinavia to the Mediterranean coast, he has absorbed more, and hopes he is still learning. Writing about fishing, hillwalking, canoeing and camping, Tim had the first of many magazine articles published in 1990. He is a regular contributor to Canoe and Kayak UK and Bushcraft and Survival Skills, and often writes for The Great Outdoors. When not camping, Tim and Susannah live in Devon, England, midway between Dartmoor and the Atlantic coast. It doesn’t take a great intellect to deduce from its title that this book is about two leisure-time activities: canoeing and camping. However, it could be argued that the world of canoe-camping is divided into two camps – no pun intended: those who camp in order to enhance their canoeing experience, and those who canoe in order to enhance their camping experience. I may be wrong, but my inference from reading this book is that the author, Tim Gent, fits more naturally into the latter than into the former of my two spurious sub-divisions. One of the great premises of the book is that there is no excuse whatsoever for suffering unnecessary discomfort while camping – if you’ve reached your campsite by canoe! He points out that the original purpose of the canoe was to transport people and large quantities of stuff from where they were to where they wanted to be! If it was good enough for the aboriginal populations of North America, then it should be good enough for us! Tim is certainly a great enthusiast for outdoor life – both at work and at play – and the expertise that his wide experience has brought him has led to him writing articles for publications about fishing, hillwalking, canoeing and camping. He is a regular contributor to Canoe and Kayak UK and Bushcraft and Survival Skills. I think it is fairly safe to say that he knows his stuff! Another of his skills is his ability to write about what he knows in a clear and concise way, which makes this book easy to read. Tim also writes of his personal philosophy and approach to life, which make canoeing and camping – and canoe-camping – a means of attaining great inner peace and fulfilment. Perhaps the last chapter – ‘Final thoughts’ – should be right at the start of the book and entitled ‘First Thoughts’, as it is in this section that he lays bare his soul and the purifying effect that the outdoor life has on it. Encouragement, indeed, to everyone to get out there and enjoy the beauty of the natural world! So, what is the book about? What the book isn’t is a sort of ‘canoe-camping by numbers’ instruction manual. You will not find amongst its pages a detailed list of, for example, which particular make and model of folding saw to take along with you; there is no recommendation as to which make and model of tent you should buy; nor which length, shape, make or model of canoe; nor which camp-stove; nor which river, lake, loch or fjord you should paddle; nor which… Actually, I think you have probably got the idea by now! Another thing that this book isn’t is a bushcraft bible! Although Tim talks about various methods of making fire, he takes a very practical and pragmatic view to living comfortably ‘under canvas’ , and consequently advocates the use of matches! This may be heresy to the more ardent bushcrafters amongst us, but it encourages those who may lack confidence because of a lack of such esoteric skills as using a bow-drill to get out there with a box of Swan Vestas and have a go! In this book Tim takes the reader through all the stages of a successful canoe-camping experience, from the first glimmer of the idea of such an undertaking – perhaps with a group of mates sitting with a pint in hand in a pub – to being back at home, happy and contented, and ready to write a blog to inspire others to follow in his footsteps. The sections lead us through what to take, the canoe of choice, packing and loading the canoe, the paddle journey, where to go, selection of campsites, open fires, cooking, foraging, a camper’s code of behaviour, other possible activities on site: the book is very comprehensive. Tim, with the zeal of the enthusiast, would like everyone to share with him the joy of a successful and safe canoe-camping experience, but with an emphasis on the ‘successful and safe’. To that end, there is a very good section towards the end of the book, which discusses how to avoid unexpected and unwanted unfortunate incidents, and how to deal with them and their ramifications should they occur. Although there is some particularly useful detailed advice on such issues as hypothermia, he argues that we should all be aware of our limitations and of the potential hazards and make informed choices through ongoing, dynamic, internal risk-assessments. Each section of the book stands alone; there is no need to read the whole book from cover to cover, and Tim often advises the reader to skip sections if they are already confident about the content. Having said that, he does back up what he writes with personal experience, and we can all learn something, I would hope, from other people. I did read the book from cover to cover, in two sittings, and I enjoyed it. As a self-confessed ‘grammar-fascist’, I found the book to be very well written, with only a couple of typographical errors and one superfluous ‘already’. Tim’s writing style is concise and flows as easily as the rivers on which he paddles. There are also many ripples of laughter provided by his humour. 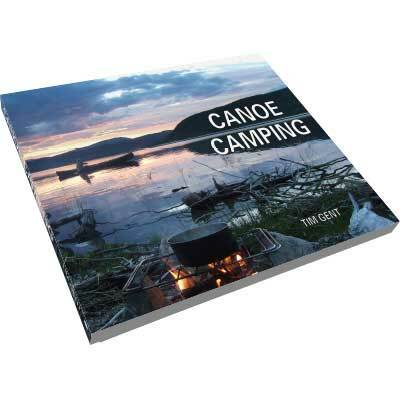 Particularly appealing are the many glorious photographs which illustrate the book, most of which make you wish you were out there in your canoe with your camping kit on board.